Hi Gail. 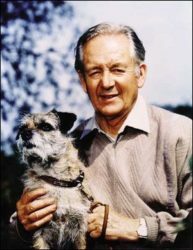 I’m a 45 year old fan of animal stories but especially of Mr Herriot. Someone I wish I could have known on a personal level. His self-effacing stories have never ceased to delight. If only I could get my hands on all of them. As it is, I’ve just finished reading Every Living Thing for the fourth time (I read it once every few years LOL).. May The Lord God make more people like him (no pun intended). Very grateful for the article on Calum Buchanan (which I’m about to read). A truly “rum feller” indeed..